Endo F2 is a highly specific recombinant endoglycosidase which cleaves within the chitobiose core of asparagine-linked complex biantennary and high mannose oligosaccharides from glycoproteins and glycopeptides. 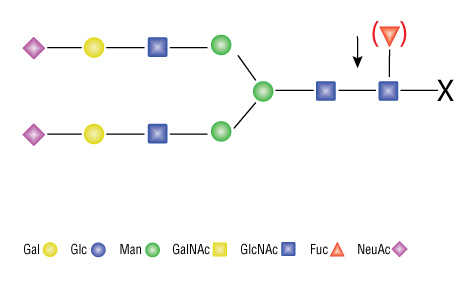 Endo F2 cleaves biantennary glycans at a rate approximately 20 times greater than high mannose glycans. The activity of Endo F2 is identical on biantennary structures with and without core fucosylation. However, Endo F2 is not active on hybrid or tri- and tetra-antennary oligosaccharides. Cloned from Elizabethkingia miricola (formerly Flavobacterium meningosepticum) and expressed in E. coli (1). One unit is defined as the amount of enzyme required to cleave > 95% of the carbohydrate from 10 µg Porcine Fibrinogen in 1 hour at 37°C in a total reaction volume of 10 µl..
Two fold dilutions of Endo F2 are incubated with 10 µg Porcine Fibrinogen and 1X GlycoBuffer 4 in a 10 µl reaction. The reaction mix is incubated at 37°C for 1 hour. Separation of reaction products are visualized via SDS-PAGE. The enzyme can be used under denaturing and non-denaturing (native) conditions. However, optimal activity occurs under non-denaturing conditions. Guthrie, E. Unpublished results. 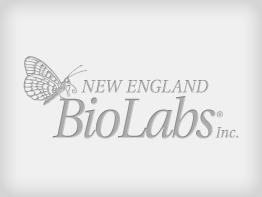 New England Biolabs, Inc..
What is the difference between PNGase F and Endo F2? What is the difference between Endo F2 and Endo F3? How much Endo F2 should I use to deglycosylate a glycoprotein under native conditions? What is the preferred substrate for Endo F2? Do detergents inhibit Endo F2 activity? What is the optimal pH for Endo F2 activity? How do I eliminate Endo F2 from a reaction? What is the binding capacity of the Magnetic Chitin Beads used to remove Endo F2? Is Endo F2 compatible with downstream analysis such as HPLC and Mass Spectrometry? Endo F2 is typically used under non-denaturing (native) conditions, as denaturation is not necessary for optimal activity of the enzyme. Concentrations of 0.5% SDS do not inhibit Endo F2 activity when used in the presence of 1% NP-40. Although not as optimal, cleavage can also occur at pH 6.0 (10X Glycobuffer 3).